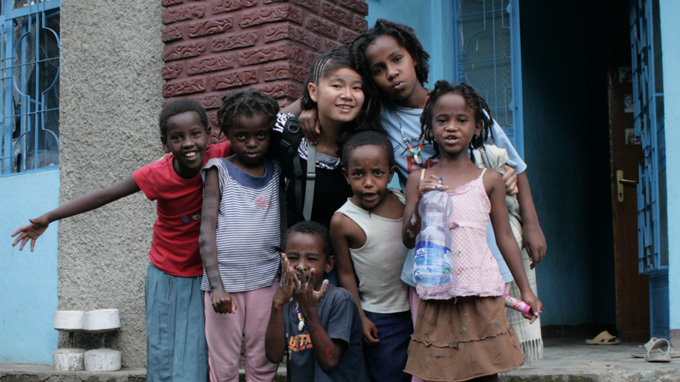 Photo capturing Huyen Chip with African kids. Huyen Chip, or Nguyen Thi Khanh Huyen released her book "Dung Chet Chau Phi," the second part of the series “Xach Ba Lo Len va Di” (Get your backpack and go on September 19,2013. The release ceremony of the book “Dung Chet o Chau Phi” (Don’t Die in Africa), by Huyen Chip, in Hanoi on September 19 turned into a Q and A session where a number of people questioned the author on their doubts about the book. “Dung Chet Chau Phi” is the second part of the series “Xach Ba Lo Len va Di” (Get your backpack and go) featuring the journey of 23-year-old Huyen Chip, or Nguyen Thi Khanh Huyen, on her own through 25 countries with only US$700 to start with. The first one is “Chau A La Nha, Dung Khoc” (Asia is Home, Don’t Cry), released last year. Through her journey and her book the young woman has attracted many fans who have expressed their admiration for the young girl for her brave and incredible spirit. However, a group that is just as large has questioned what Huyen wrote in her book, which she called her travel diary. Since then, the book has caused a stir on the Internet with an argument between Huyen’s fans and opponents, who say she wrote the book based on her imagination, not what she really went through. At the book release on Thursday, Huyen responded to her doubters. One of the biggest questions is how Huyen was able to get visas to so many countries as easily as described in the book. A lot of netizens said Huyen couldn’t have had financial demonstration, the most important step to get a visa to many countries, while she had only US$700. In reply, Huyen said it’s hard to get visas, but not for all countries. For people who said travelling with US$700 is a big lie, Huyen also confirmed that she worked to earn money for the travel. “It’s not as hard to work in other countries as you have imagined. Whether you can get a job doesn’t depend on where you’re from, it depends on how well you work,” Huyen said, while showing the websites for which she worked as a contributor during her travels. However, this explanation didn’t satisfy some people, who requested more trustworthy proof, even though Huyen showed her visas. In addition, many people expressed concern that a lot of youths who admire Huyen would follow her in not attending university, instead traveling alone and bringing themselves into danger when they haven’t been equipped with enough skills for such a huge journey. According to Huyen, she didn’t encourage people to do exactly what she did. “Everybody has their own directions. I just want to be an honest story teller to share my experiences in the lands I visited,” she shared.